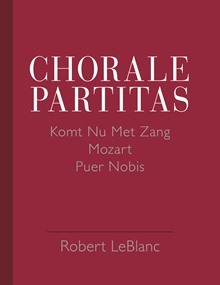 This fresh and new collection of chorale partitas by organist and composer Robert LeBlanc is sure to fascinate and charm both congregations and audiences alike. Written mostly at an intermediate to advanced level, these short variations serve well as both materials for liturgy as well as for the concert or recital stage. Hymn tunes included are KOMT NU MET ZANG ("What Is This Place"), MOZART ("Come, Sing a Home and Family"), and PUER NOBIS ("That Easter Day with Joy Was Bright"). Robert LeBlanc is an established composer, pianist and organist, who has published works with all major Catholic publishers in the United States. He is presently Director of Music at the Shrine of Saint Jude in Rockville, Maryland. In 2008 he was commissioned to write several pieces for the Mass at Nationals Stadium celebrated by Pope Benedict XVI during his visit to the Washington area, and again in 2015 for the visit of Pope Francis. His music was also used extensively at the 2013 Convention of the National Pastoral Musicians in Washington DC. He resides with his wife in Ashton, Maryland.